This tab displays all of the general information about the client, contact details, Parent / Child Clients & Middleman. Contact Details - The main page of the Client Card, as described below. Relationship - Displays the relationship log of the client. For further information Click here. Documents - Storing files and documents related to the customer. For further information Click here. Sales - manage the sales processes and the accounting of the client. For further information Click here. More info - Adding a custom functions, according to the needs and requirements of the organization. For further information Click here. Trading System Interface - Hyper was designed to be used as CRM and Accounting system that supports trading systems. The system offers an expansion for the client card in order to allow trading and receiving a live information from trading systems as well as using the trading action wizard of hyper. For further information Click here. Main - The Client's general details, including Identification information, organization details and type, Relationship abstract, etc. Additional Contacts - Additional contact persons. Map - Locate the company according to its address. Parent / Child Clients & Middleman - Clients and Middleman related to this client (e.g. holding company, subsidiary company). Spare Fields - Additional information fields according to the organization needs and requirements. Client Full Name Combined the Last name and the First Name. Client Number An automatic and unique client number, given by the system. Agency Choose the agency (Branch) of the organization, for the client. Handling Status The default status of any new client is "New". - New Client or Lead with only contact details and general information. This status is given to any new client. - Follow Up. This is the status of the client after the first contact with the organization representative. The contact details will be displayed in the "Relationship" tab of the client card. - Follow Up + Meeting / P.Offer. This is the status of the client after creating a first meeting or giving a first price offer. - Real Client. The status of the Client after the first approved Order / sale. This client has an accounting activity as well as Bookkeeping entry. - Real Client + Club / Contract. The status of the Client after the first approved Order / sale. This client may be a club member or has an accounting activity and contracts, as well as Bookkeeping entry. - Client Not Interested. 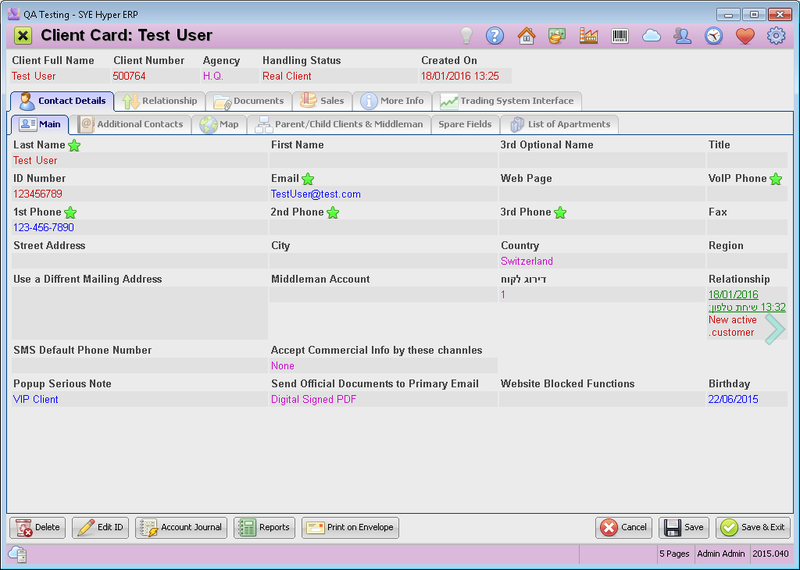 This status is defined by the user due to a meeting or a phone call, in the Relationship Tab of the Client Card. This status in not available for a "Real Client" status. Please note - This status can be defined only after updating a meeting summary or a conversation abstract. - Problematic (Read Notes). This status is defined by the user for a client with a current status of "Real Client", that doesn't want to continue the relationship with the organization. Please note - This status can be defined in the Relationship Tab of the Client Card, only after updating a meeting summary or a conversation abstract. - Fictive Contact. This status is available for new clients only. This status is used for unavailable clients and for new leads with no potential to become a real clients. In this tab, fill in the clients contact details and general information. Additional descriptions and explanations about the information fields can be found in the bottom of this page. Please note - mandatory fields are marked with . Also, please pay attention to "ID Dock Type" field, which defines whether this client is a Private Person or a Corporation. this definition is important especially for organizations that provide currencies services. Delete Delete the Client Card. Edit ID Edit the general details of the client card: Last Name, First Name, 3rd Optional name, ID Dock Type, Country, ID Number. Account Journal This button opens the accounting area of the client and displays the Bookkeeping entries and account activities as well as the formal produced documents. Reports This button opens a useful suggested reports menu for the user. Print an Envelope Print the contact details of this client on an envelope.. Please Note - mandatory fields are marked with . Filling in wrong or partial details, may cause some errors that will be related to this client card. For contact person with a legal status in the Corporation (if defined in the "ID Dock Type" field), the user should pay attention to the following fields: Last Name, First Name, ID Number, Legal Status, Gender and Birthday. These fields are required for regulation needs. After filling in the information fields of the client card, click the save button. Verify Address on Google In order to see the location of the client, fill in the exact address in the Main tab. The system will also display the GIS Latitude and Longitude. Zoom In / Zoom Out Change the map view. Save Map Image Save the map image in this tab. Open Google Interactive Map Open the browser to view this location in Google Maps. Clients can be related to other clients (Parent / Child) or to Suppliers (Middleman). The table in this tab contains all of the clients and suppliers that are related to this client. Double click on a record to open its Hyper card. A linkage between Clients (Parent/Child) is done by defining the "Parent Client Account Name" field. This Client will be automatically marked as a "Child Client" in the Parent client card. A linkage between a client and a middleman is done by the "Middleman Name" field. The middleman should be first defined as middleman in its supplier card. This tab is used for additional information fields according to the organization needs and requirements.